The ShamExpress x The Opera House colt who sold for $510,000 at Karaka this week. 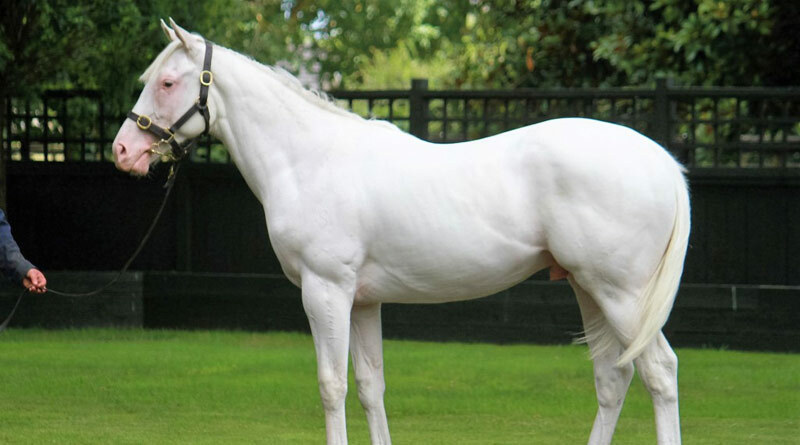 A white thoroughbred colt bred in New Zealand has sold to China for $510,000 at the country’s premier yearling sales in Auckland this week. The colt by ShamExpress and from the white mare The Opera House was offered by Windsor Park Stud. The Opera House made headlines as one of only a few registered white thoroughbreds in the world, when she was born at Cambridge Stud in 2006. The daughter of Zabeel, a three-quarter sister to Might and Power, went on to be the first white thoroughbred filly sold at auction in Australia when she was bought by John Singleton for $A280,000 as yearling in 2008. Singleton ran a promotion offering racing shares in the filly and she duly performed on the racetrack, winning one and placing in five of nine starts before being retired to stud after sustaining a leg injury. Bidding was spirited on Tuesday for the ShamExpress colt, with Michael Wallace winning out on behalf of the China Horse Club and Victorian trainer Ciaron Maher. Wallace and Maher intend to syndicate the colt to race, and said there were still a few spots available. The colt’s white half sister by High Chapparal sold to Japanese businessman Hideo Takadaru last year, for $450,000. She is now named Casta Diva.